we introduced integration by parts as a way to compute antiderivatives of a product of functions and we saw how certain integration by parts problems are handled more efficiently with the so-called tabular method (or, in Stand and Deliver, the “tic-tac-toe” method). 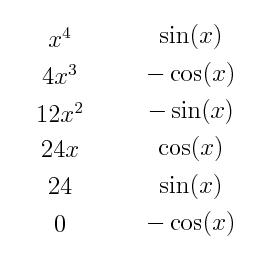 In this post, we will consider the following question: As integration by parts requires the making of a choice—which is your u and which is your dv—how can we make this choice so that the resulting integral is easier to compute? I usually make a show of how sometimes the order does matter…That is, I’ll let and the first time and then go through it and say something like, “Well, that didn’t get us much of anywhere. What if we switch up our u and dv this time? Let’s let and .” Then when you work it through, everything cancels out and we’re back to the original problem. Indeed, Dave. Let’s take a look at what happens if we switch it up. Egad, Dave is right. Since the product of the terms in the last line of the table is what we will need to integrate, doing it this way just makes things worse. 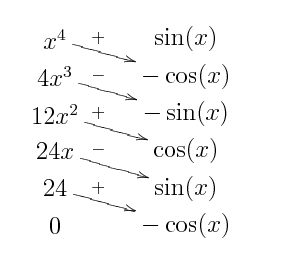 Ah, but what if we start with the cosine on the left and then switch it up? Oh, yeah, we’ll just get back what we started with. This suggests that we should always put a polynomials on the left so that it doesn’t go up in degree. It turns out that there are several examples where this is precisely the wrong thing to do. We implicitly saw this in the first post, but let me give you a couple of more explicit examples. and at the very least we have gotten rid of the . In fact we have done more, but we’ll have to wait until the next post to resolve this. This says, for example, that when confronted with , differentiate the and integrate . In our next segment, we will introduce the box method for handling several of the integrals left unsolved in this post. we introduced integration by parts as an analogue to the product rule. We start this post with an example to show why the method can become tedious. Using linearity, we reduce the question to solving . Hold on, now. Is that really an improvement? and after using linearity, we only need to compute . Before you get up and leave, notice that the power of is one less again. 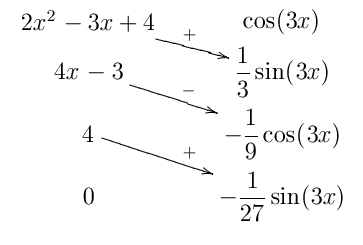 Seriously, each time we do this process, the exponent will decrease by one (since we are differentiating). So we “only” need to do it two more times. Agreed. This is why it is nice to automate the process. I first learned this by watching Stand and Deliver over and over while in high school. I am not much of a fan of Battlestar Galactica (nerd cred…plummeting) and the few times I watched, I thought Edward James Olmos’ portrayal of William Adama was really flat; I thought Olmos was mailing in the performance. The most likely reason for my feelings? If you’ve never seen it, watch Stand and Deliver and Olmos’ portrayal of math teacher Jaime Escalante. Now that was a performance. Anyhow, here is the clip I watched incessantly. Essentially, this creates an alternating sum. In practice, it means we can set up the following chart where, going down, we differentiate on the left until we get and antidifferentiate on the right as many times as we differentiated. Notice here that we are condensing quite a bit of notation with this method since we are no longer using the u, v, du, and dv notation. But, we are getting out precisely the same information. We draw diagonal left-to-right arrows to indicate which terms multiply and we superscript the arrows with alternating pluses and minuses to give the appropriate sign. as the antiderivative for . Indeed. Next time we’ll take this a step further and show how to handle some situations where neither function is a polynomial. This will also bring up the question, again, about how to choose which function to differentiate and which to integrate. This is the first in a series of posts on one of my favorite methods of antidifferentiation: integration by parts. I didn’t love it at first, but a little practice and a few tricks made me appreciate it. Teaching it, well, that is where the love affair begins. Let me assume that the reader is familiar with basic differentiation (including the product rule) and antidifferentiation of some basic elementary functions, i.e., the reader knows such facts as the power rule and how to antidifferentiate exponential functions as well as sine and cosine. An example may be helpful. A canonical first example is . The typical calculus student, fooled by the simplicity of the sum rule and not having the product rule in mind, will incorrectly assert . Of course, differentiating shows that this answer is wrong. Why? Well, because antidifferentiation is additive but isn’t multiplicative. Could I see one more? Sure, here is a less obvious example. Consider . Wait, there is no product of functions. How do I keep everything straight? You can then simply plug everything into the integration by parts formula. This isn’t so bad. Why do you need multiple posts? For those who don’t know the punchline, I won’t spoil it here. It suffices to say that there are some harder problems out there and there are some really efficient ways of handling these difficulties. Stay tuned!